I have a small collection of WWI and II artillery she!! cases; and generally I go for the standard unaltered cases. 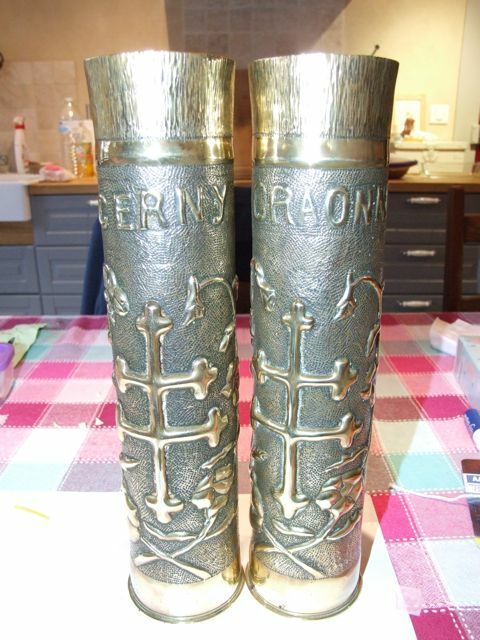 However recently I found a pair of 75mm French field gun cases that have been modified; probably in period and they are in remembrance of the Chemin des Dames. The names Cerny and Craonne, being two of the villages destroyed during that battle. Being the centenary year for the end of WWI; I thought they should have a place in my collection. They are 1917 dated cases. 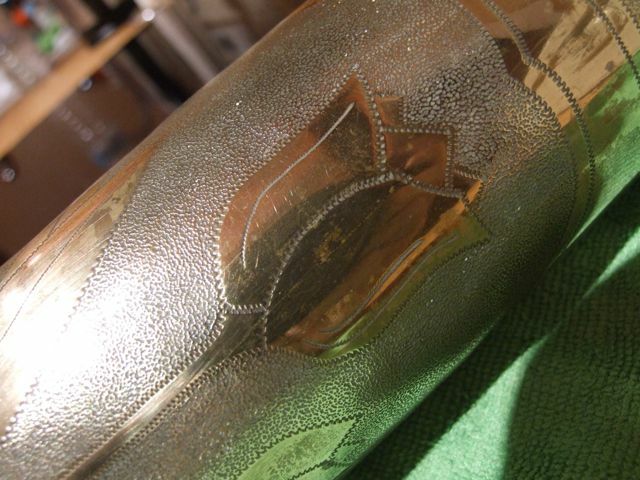 My only other trench art piece also mentions Craonne; which is partly why these ones caught my eye. The workmanship on these two is quite good; although not a nice as my first piece below. Zed: isn't that the "Vichy" french symbol on those cases? The "Croix de Lorraine" was used by the French resistance in WWII and the Free French forces. Prior to that it was also used in the Alsace region flag before WWI. So may have some significance as to the origins of the soldier who sculpted these. It originally dates from the 14th or 15th century. I've seen the engravings in the limestone tunnels at Beaumont Hammel, where the Newfoundlanders were hunkered down. They are fantastic. I've seen WWI lighters made in the trenches out of spent .303 casings. I'm always amazed at what creative minds glean from the debris of war. I thought Vichy was a double bitted axe as a symbol? I've been keeping my eye out for a proper trench cigarette lighter. I've seen some broken and incomplete ones, but nothing worth saving yet.